The RVCA produces individual reports for ten catchments in the Middle Rideau subwatershed. Using data collected and analysed by the RVCA through its watershed monitoring and land cover classification programs, surface water quality conditions are reported for Irish Creek along with a summary of environmental conditions for the surrounding countryside every six years. Figure 10 shows the extent of the naturally vegetated riparian zone along a 30 metre deep/wide area of the shoreline of Irish Creek and its tributaries. This information is derived from a dataset developed by the RVCA’s Land Cover Classification Program through heads-up digitization of 20cm DRAPE ortho-imagery at a 1:4000 scale, which details the catchment landscape using 10 land cover classes. 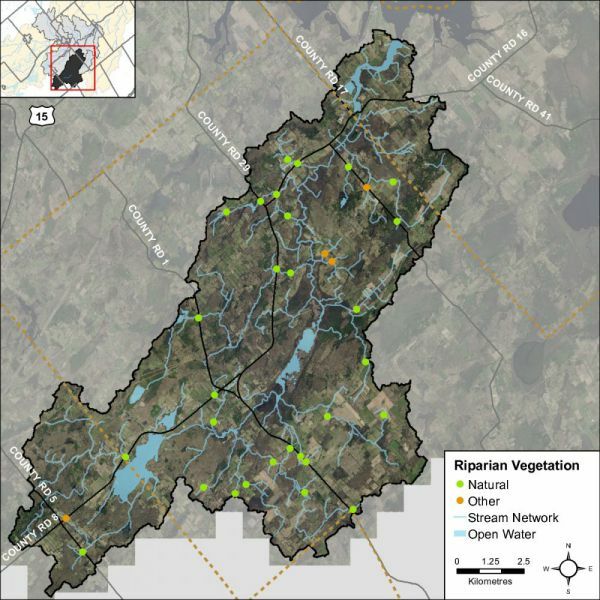 This analysis shows that the riparian buffer in the Irish Creek catchment is comprised of wetland (53 percent), crop and pastureland (25 percent), woodland (18 percent), roads (two percent) and settlement areas (two percent). Additional statistics for the Irish Creek catchment are presented in Table 7 and show that there has been very little change in shoreline cover from 2008 to 2014. 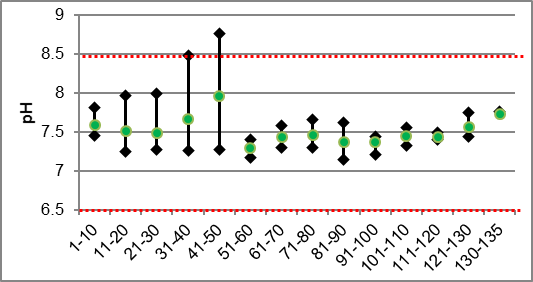 Figure 11 demonstrates the buffer conditions of the left and right banks separately. Irish Creek had a buffer of greater than 30 meters along 97 percent of the right bank and 98 percent of the left bank. The RVCA’s Stream Characterization Program identifies six different land uses beside Irish Creek (Figure 12). Surrounding land use is considered from the beginning to end of the survey section (100m) and up to 100m on each side of the creek. Land use outside of this area is not considered for the surveys but is nonetheless part of the subwatershed and will influence the creek. Natural areas made up 95 percent of the stream, characterized by wetlands, forest, scrubland and meadow. Wetland habitat was dominant in the adjacent lands along Irish Creek at 80 percent. The remaining land use consisted of residential and infrastructure in the form of road crossings. Erosion is a normal, important stream process and may not affect actual bank stability; however, excessive erosion and deposition of sediment within a stream can have a detrimental effect on important fish and wildlife habitat. Poor bank stability can greatly contribute to the amount of sediment carried in a waterbody as well as loss of bank vegetation due to bank failure, resulting in trees falling into the stream and the potential to impact instream migration. Figure 13 shows low levels of erosion along Irish Creek. Undercut banks are a normal and natural part of stream function and can provide excellent refuge areas for fish. Figure 14 shows that Irish Creek had low levels of undercut banks along the system. Grasses, shrubs and trees all contribute towards shading a stream. Shade is important in moderating stream temperature, contributing to food supply and helping with nutrient reduction within a stream. 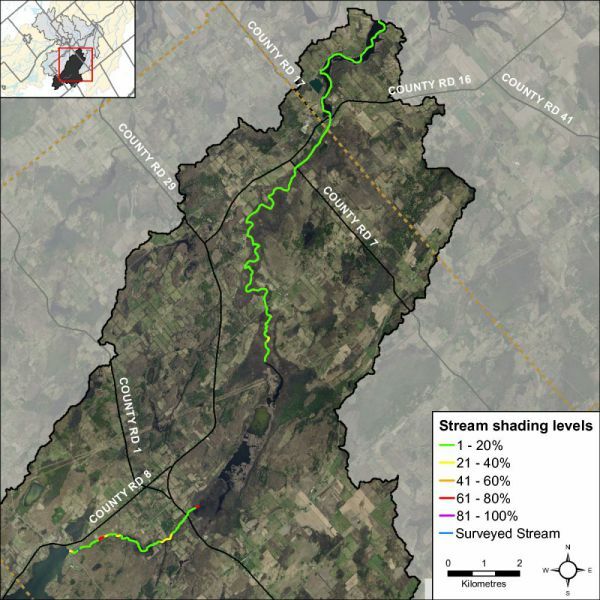 Figure 15 shows low levels of stream shading dominate conditions in most reaches of Irish Creek. 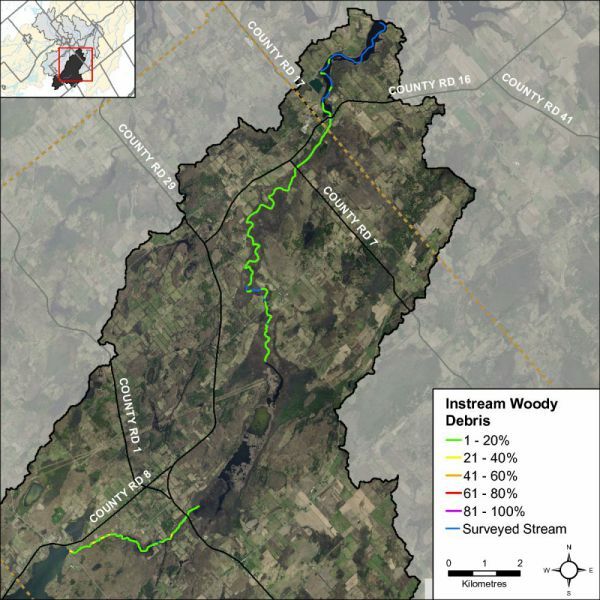 Figure 16 shows that the majority of Irish Creek had low to moderate levels of instream woody debris in the form of branches and trees. Instream woody debris is important for fish and benthic invertebrate habitat, by providing refuge and feeding areas. Figure 17 shows the system is dominated by low to moderate levels of overhanging branches and trees along Irish Creek. Overhanging branches and trees provide a food source, nutrients and shade which helps to moderate instream water temperatures. Figure 18 shows 94 percent of Irish Creek remains “unaltered” with no anthropogenic alterations. Five percent of Irish Creek was classified as natural with minor anthropogenic changes and one percent was considered altered in the form of road crossings. Freshwater benthic invertebrates are animals without backbones that live on the stream bottom and include crustaceans such as crayfish, molluscs and immature forms of aquatic insects. Benthos represent an extremely diverse group of aquatic animals and exhibit wide ranges of responses to stressors such as organic pollutants, sediments and toxicants, which allows scientists to use them as bioindicators. As part of the Ontario Benthic Biomonitoring Network (OBBN), the RVCA has been collecting benthic invertebrates at the Kinch road site on Irish Creek since 2003. Monitoring data is analyzed for each sample site and the results are presented using the Family Biotic Index, Family Richness and percent Ephemeroptera, Plecoptera and Trichoptera. The Hilsenhoff Family Biotic Index (FBI) is an indicator of organic and nutrient pollution and provides an estimate of water quality conditions for each site using established pollution tolerance values for benthic invertebrates. FBI results for Irish Creek are separated by reporting period 2003 to 2008 and 2009 to 2014. 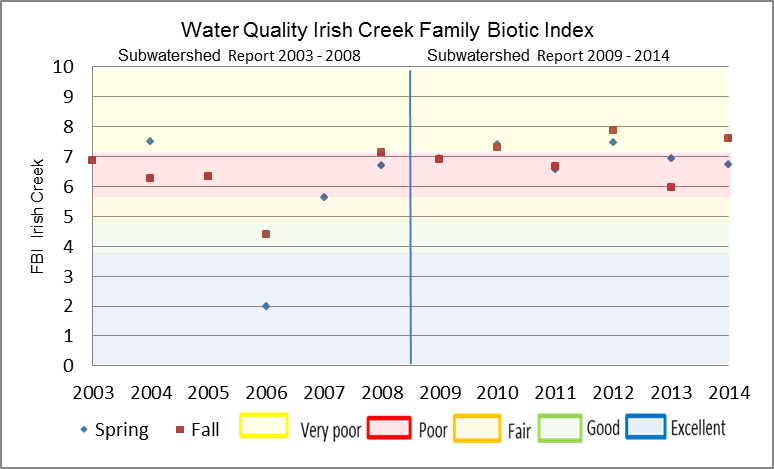 “Poor” to “Very poor” water quality conditions being observed at the Irish Creek sample location for the period from 2003 to 2014 (Fig.19) using a grading scheme developed by Conservation Authorities in Ontario for benthic invertebrates. Family Richness measures the health of the community through its diversity and increases with increasing habitat diversity suitability and healthy water quality conditions. Family Richness is equivalent to the total number of benthic invertebrate families found within a sample. 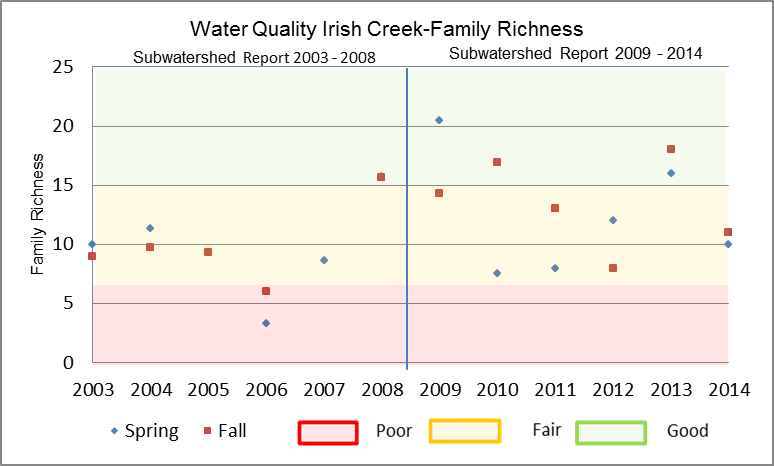 Irish Creek is reported to have “Poor” to “Good” family richness (Fig.20). Ephemeroptera (Mayflies), Plecoptera (Stoneflies), and Trichoptera (Caddisflies) are species considered to be very sensitive to poor water quality conditions. High abundance of these organisms is generally an indication of good water quality conditions at a sample location. During more recent sampling years the community structure has been shifting to species that are more sensitive to poor water quality conditions. 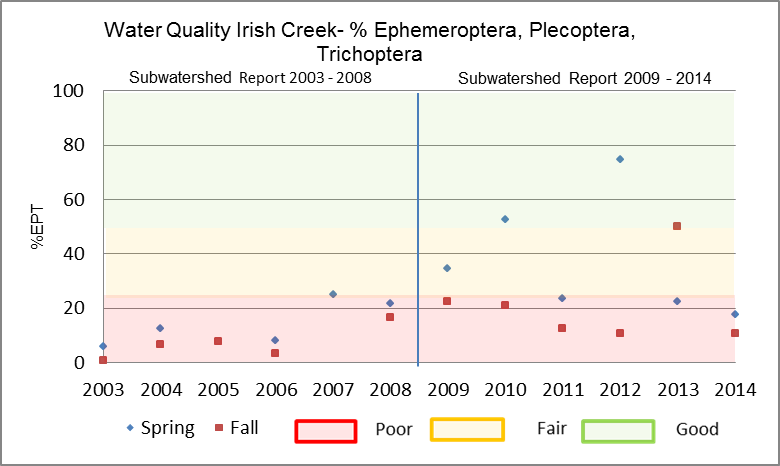 As a result, the EPT indicates that Irish Creek is reported to have “Poor” water quality (Fig.21) from 2003 to 2014. Overall Irish Creek aquatic habitat conditions from a benthic invertebrate perspective is considered “Poor” from 2003 to 2014 as the samples are dominated by species that are tolerant of high organic pollution levels. Streams are naturally meandering systems and move over time; there are varying degrees of habitat complexity, depending on the creek. Examples of habitat complexity include variable habitat types such as pools and riffles as well as substrate variability and woody debris structure. A high percentage of habitat complexity (heterogeneity) typically increases the biodiversity of aquatic organisms within a system. Forty percent of Irish Creek was considered heterogeneous, as shown in Figure 22. The majority of the Irish Creek system is classified as a riverine wetland. Diverse substrate is important for fish and benthic invertebrate habitat because some species have specific substrate requirements and for example will only reproduce on certain types of substrate. Figure 23 shows that 74 percent of the substrate observed on Irish Creek was dominated by silt and organic substrate consistent with wetland habitat conditions. Overall substrate conditions were fairly uniform along Irish Creek. Figure 24 shows the dominant substrate type observed for each section surveyed along Irish Creek. Figure 24 shows the dominant substrate type along Irish Creek. Boulders create instream cover and back eddies for large fish to hide and/or rest out of the current. Cobble provides important spawning habitat for certain fish species like walleye and various shiner species who are an important food source for larger fish. 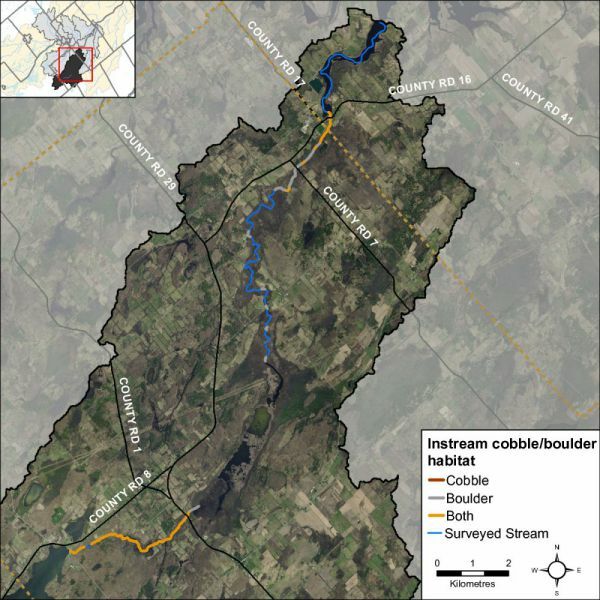 Cobble can also provide habitat conditions for benthic invertebrates that are a key food source for many fish and wildlife species. Figure 25 shows where cobble and boulder substrate are found in Irish Creek. Pools and riffles are important habitat features for fish. Riffles are areas of agitated water and they contribute higher dissolved oxygen to the stream and act as spawning substrate for some species of fish, such as walleye. Pools provide shelter for fish and can be refuge pools in the summer if water levels drop and water temperature in the creek increases. Pools also provide important over wintering areas for fish. Runs are usually moderately shallow, with unagitated surfaces of water and areas where the thalweg (deepest part of the channel) is in the center of the channel. Figure 26 shows that Irish Creek is fairly uniform; 83 percent consists of runs, 1 percent riffles and 16 percent pools. Figure 27 shows where the limited areas of riffle habitat were observed along Irish Creek. Instream vegetation provides a variety of functions and is a critical component of the aquatic ecosystem. For example emergent plants along the shoreline can provide shoreline protection from wave action and important rearing habitat for species of waterfowl. Submerged plants provide habitat for fish to find shelter from predator fish while they feed. Floating plants such as water lilies shade the water and can keep temperatures cool while reducing algae growth. 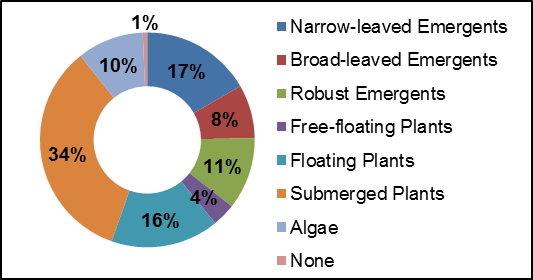 The dominant vegetation type recorded at 34 percent consisted of submerged plants. Irish Creek had high levels of diversity for instream vegetation. Figure 28 depicts the plant community structure for Irish Creek. Figure 29 shows the dominant vegetation type observed for each section surveyed along Irish Creek. Instream vegetation is an important factor for a healthy stream ecosystem. Vegetation helps to remove contaminants from the water, contributes oxygen to the stream, and provides habitat for fish and wildlife. Too much vegetation can also be detrimental. 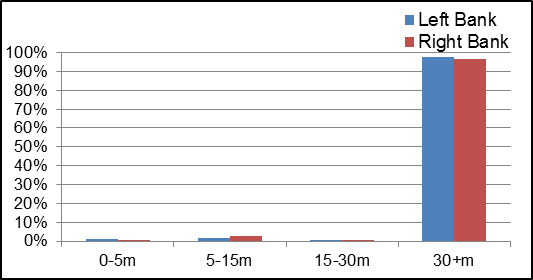 Figure 30 demonstrates that Irish Creek had common and normal levels of instream vegetation for 60 percent of its length. Extensive vegetation levels were recorded at 37 percent of stream surveys, which can result in low oxygen levels along the system. 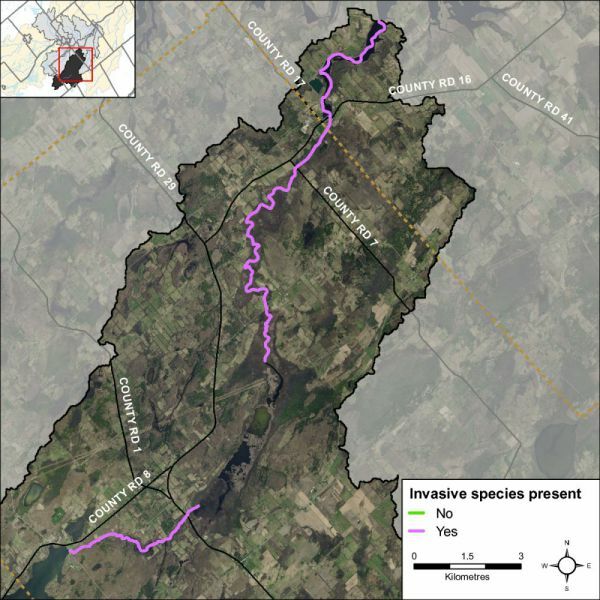 Invasive species can have major implications on streams and species diversity. Invasive species are one of the largest threats to ecosystems throughout Ontario and can out compete native species, having negative effects on local wildlife, fish and plant populations. 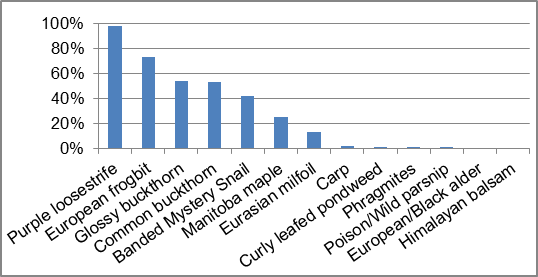 One hundred percent of the sections surveyed along Irish Creek had invasive species (Figure 31). The invasive species observed in Irish Creek were European frogbit, purple loosestrife, glossy and common buckthorn, poison/wild parsnip, carp, banded mystery snail, curly leafed pondweed, Himalayan balsam, phragmites, European/Black alder, Eurasian milfoil and Manitoba maple. 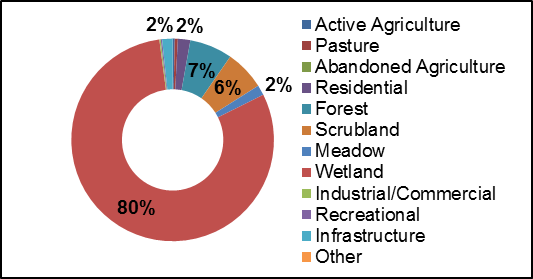 Figure 32 shows the frequency of the invasive species observed along Irish Creek. Dissolved oxygen is a measure of the amount of oxygen dissolved in water. The Canadian Environmental Quality Guidelines of the Canadian Council of Ministers of the Environment (CCME) suggest that for the protection of aquatic life the lowest acceptable dissolved oxygen concentration should be 6 mg/L for warmwater biota and 9.5 mg/L for coldwater biota (CCME, 1999). 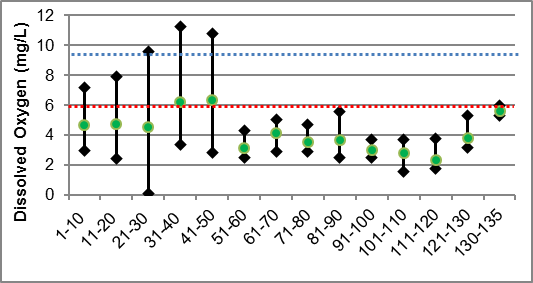 Figure 33 shows that the dissolved oxygen in Irish Creek was below the threshold for warmwater biota in most reaches of the system. The average dissolved oxygen levels observed within the main stem of Irish Creek was 4.19 mg/L which is below the recommended levels for warmwater biota. Conductivity in streams is primarily influenced by the geology of the surrounding environment, but can vary drastically as a function of surface water runoff. Currently there are no CCME guideline standards for stream conductivity; however readings which are outside the normal range observed within the system are often an indication of unmitigated discharge and/or stormwater input. The average conductivity observed within the main stem of Irish Creek was 345.8 µs/cm. Figure 34 shows the conductivity readings for Irish Creek. Based on the PWQO for pH, a range of 6.5 to 8.5 should be maintained for the protection of aquatic life. 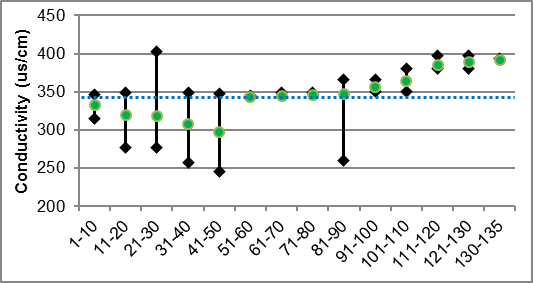 Average pH values for Irish Creek averaged 7.52 thereby meeting the provincial standard (Figure 35). Many factors can influence fluctuations in stream temperature, including springs, tributaries, precipitation runoff, discharge pipes and stream shading from riparian vegetation. Water temperature is used along with the maximum air temperature (using the Stoneman and Jones method) to classify a watercourse as either warm water, cool water or cold water. Figure 36 shows where the thermal sampling sites were located along Irish Creek and Marshalls Creek. 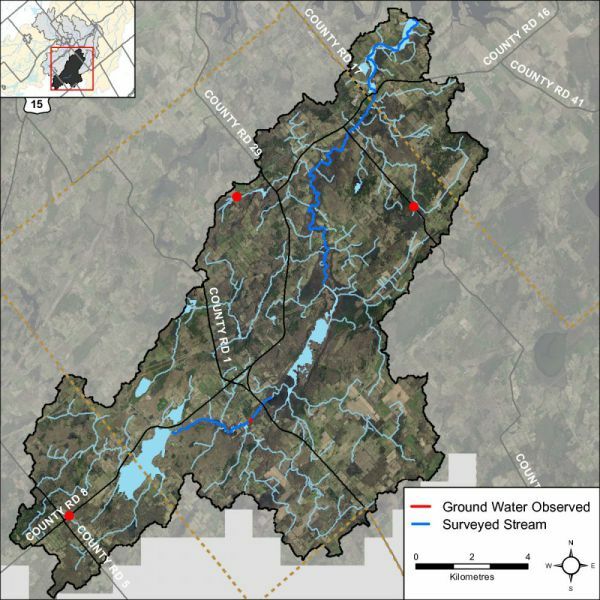 Analysis of the data collected indicates that Irish Creek is classified as a warm water system with cool water reaches (Figure 37). Figure 37 Temperature logger data for three sites on Irish Creek. 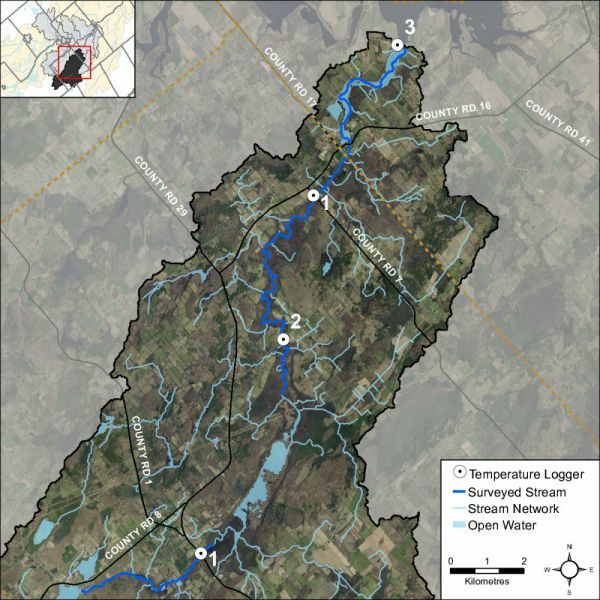 Groundwater discharge areas can influence stream temperature, contribute nutrients, and provide important stream habitat for fish and other biota. During stream surveys, indicators of groundwater discharge are noted when observed. Indicators include: springs/seeps, watercress, iron staining, significant temperature change and rainbow mineral film. 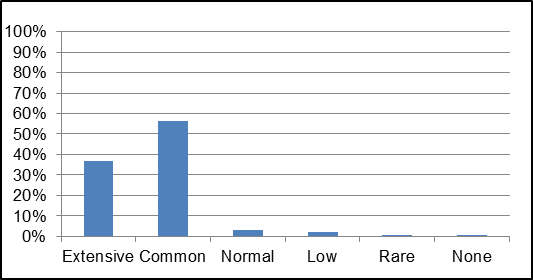 Figure 38 shows areas where one or more of the above groundwater indicators were observed during stream surveys and headwater assessments. The RVCA Stream Characterization program assessed Headwater Drainage Features for the Middle Irish subwatershed in 2014. This protocol measures zero, first and second order headwater drainage features (HDF). It is a rapid assessment method characterizing the amount of water, sediment transport, and storage capacity within headwater drainage features (HDF). RVCA is working with other Conservation Authorities and the Ministry of Natural Resources and Forestry to implement the protocol with the goal of providing standard datasets to support science development and monitoring of headwater drainage features. An HDF is a depression in the land that conveys surface flow. Additionally, this module provides a means of characterizing the connectivity, form and unique features associated with each HDF (OSAP Protocol, 2013). 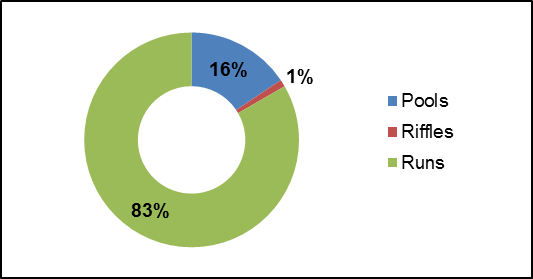 In 2014 the program sampled 34 sites at road crossings in the Irish Creek catchment area (Figure 39). The headwater sampling protocol assesses the feature type in order to understand the function of each feature. 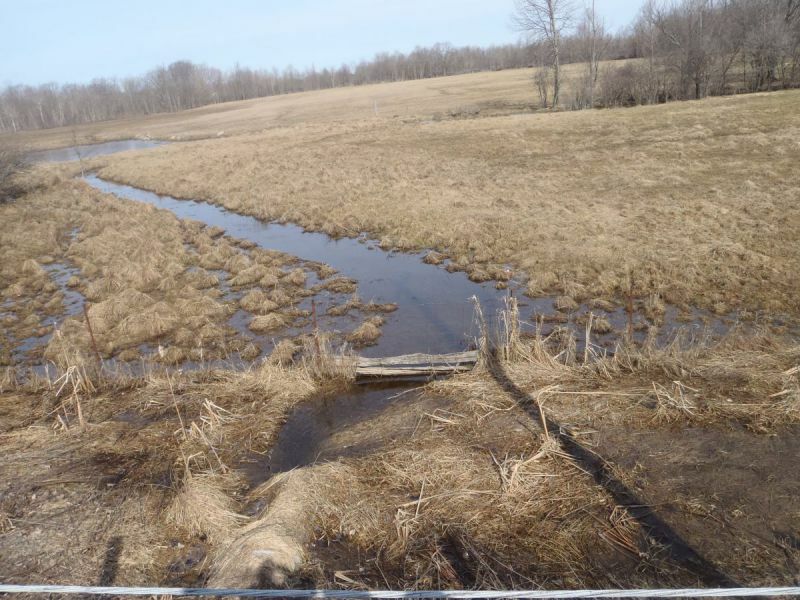 The evaluation includes the following classifications: defined natural channel, channelized or constrained, multi-thread, no defined feature, tiled, wetland, swale, roadside ditch and pond outlet. 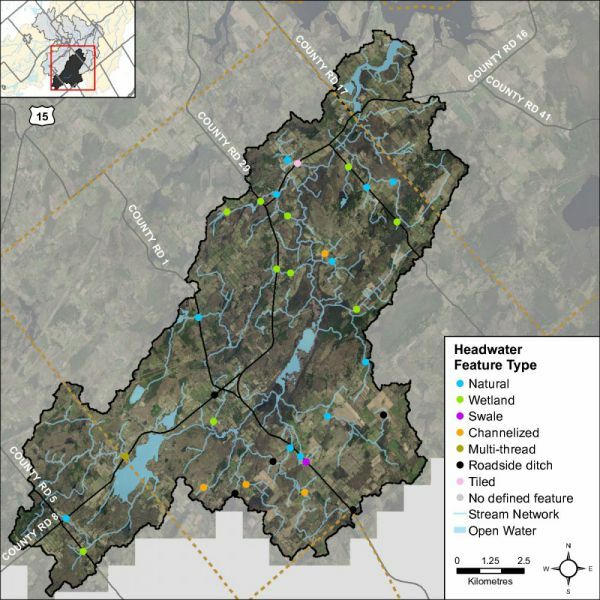 By assessing the values associated with the headwater drainage features in the catchment area we can understand the ecosystem services that they provide to the watershed in the form of hydrology, sediment transport, and aquatic and terrestrial functions. 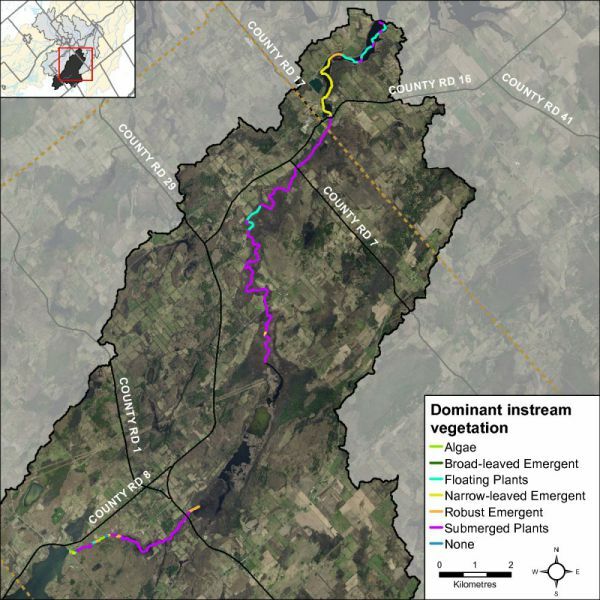 The Irish Creek catchment is dominated by wetland and natural headwater drainage features. Four features were classified as having been channelized , five features were identified as roadside drainage features and one feature was tile drained. Figure 40 shows the feature type of the primary feature at the sampling locations. The observed flow condition within headwater drainage features can be highly variable depending on timing relative to the spring freshet, recent rainfall, soil moisture, etc. Flow conditions are assessed in the spring and in the summer to determine if features are perennial and flow year round, if they are intermittent and dry up during the summer months or if they are ephemeral systems that do not flow regularly and generally respond to specific rainstorm events or snowmelt. Flow conditions in headwater systems can change from year to year depending on local precipitation patterns. Figure 41 shows the observed flow conditions at the sampling locations in the Irish Creek catchment in 2014. Channel modifications were assessed at each headwater drainage feature sampling location. Modifications include channelization, dredging, hardening and realignments. The majority of sampling locations for the Irish Creek catchment area were classified as having no channel modifications, one channel was classified as being hardened and one appeared to have been historically dredged. Figure 42 shows the channel modifications observed at the sampling locations for Irish Creek. Headwater feature vegetation evaluates the type of vegetation that is found within the drainage feature. The type of vegetated within the channel influences the aquatic and terrestrial ecosystem values that the feature provides. For some types of headwater features the vegetation within the feature plays a very important role in flow and sediment movement and provides wildlife habitat. The following classifications are evaluated no vegetation, lawn, wetland, meadow, scrubland and forest. The features assessed in the Irish Creek catchment were classified being dominated by wetland, scrubland, meadow and forest. One feature was classified as having lawn. Figure 43. Depicts the dominant vegetation observed at the sampled headwater sites in the Irish Creek catchment. Headwater riparian vegetation evaluates the type of vegetation that is found along the adjacent lands of a headwater drainage feature. The type of vegetation within the riparian corridor influences the aquatic and terrestrial ecosystem values that the feature provides to the watershed. The sample locations in Irish Creek were dominated by natural vegetation in the form of meadow, scrubland, forest and wetland vegetation. Figure 44. Depicts the type of riparian vegetation observed at the sampled headwater sites in the Irish Creek catchment. Assessing the amount of recent sediment deposited in a channel provides an index of the degree to which the feature could be transporting sediment to downstream reaches (OSAP, 2013). Evidence of excessive sediment deposition might indicate the requirement to follow up with more detailed targeted assessments upstream of the site location to identify potential best management practices to be implemented. Conditions ranged from no deposition observed to moderate deposition recorded. Figure 45. Depicts the degree of sediment deposition observed at the sampled headwater sites in the Irish Creek catchment. Feature roughness will provide a measure of the amount of materials within the bankfull channel that could slow down the velocity of water flowing within the headwater feature (OSAP, 2013). Materials on the channel bottom that provide roughness include vegetation, woody debris and boulders/cobble substrates. Roughness can provide benefits in mitigating downstream erosion on the headwater drainage feature and the receiving watercourse by reducing velocities. Roughness also provides important habitat conditions to aquatic organisms. The sample locations in the Irish Creek catchment area ranged from moderate to extreme roughness conditions. Figure 46 shows the feature roughness conditions at the sampling locations in the Irish Creek catchment. 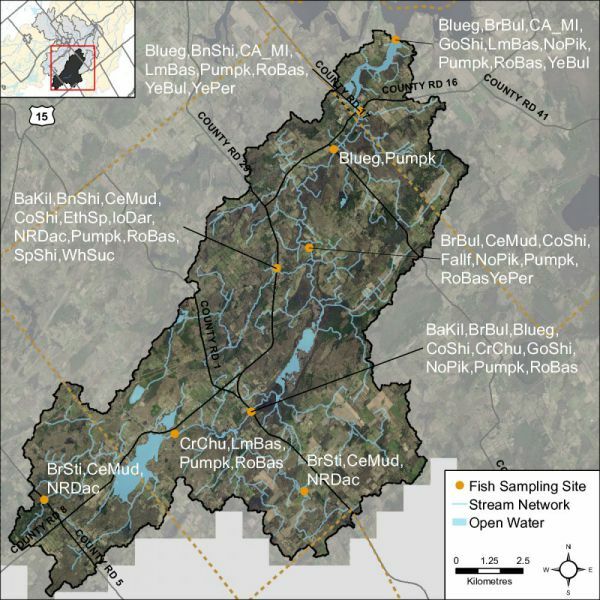 The Irish Creek catchment is classified as a mixed community of warm and cool water recreational and baitfish fishery with 22 species observed. Table 8 lists those species observed in the catchment (Source: MNR/RVCA). Figure 47 shows the sampling locations along Irish Creek. It is important to know locations of migratory obstructions because these can prevent fish from accessing important spawning and rearing habitat. Migratory obstructions can be natural or manmade, and they can be permanent or seasonal. Figure 48 shows that Irish Creek had multiple beaver dams, one perched culvert and one grade barrier at the time of the survey in 2014. 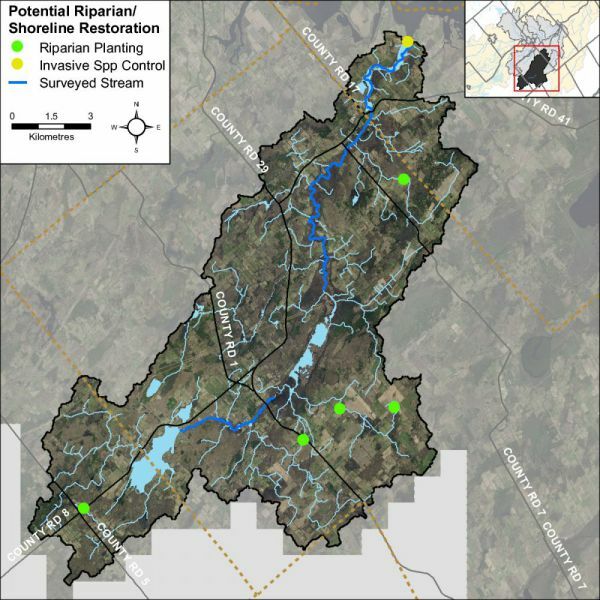 Figure 49 depicts the location of a riparian restoration opportunity as a result of observations made during the stream survey and headwater drainage feature assessments. Land cover and any change in coverage that has occurred over a six year period is summarized for the Irish Creek catchment using spatially continuous vector data representing the catchment during the spring of 2008 and 2014. 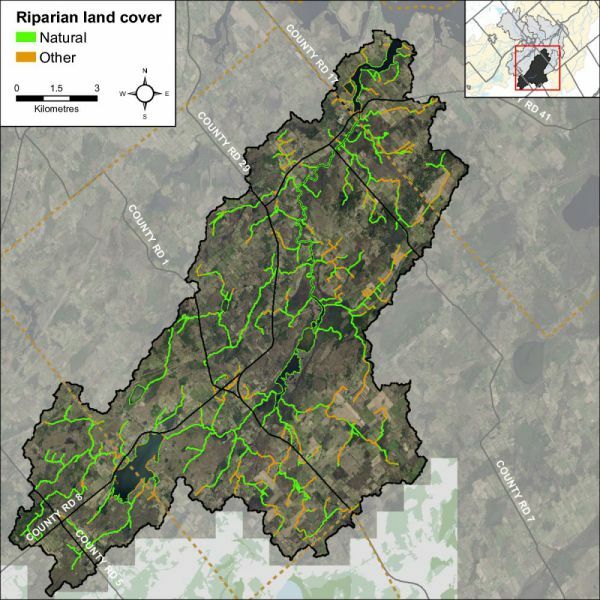 This dataset was developed by the RVCA through heads-up digitization of 20cm DRAPE ortho-imagery at a 1:4000 scale and details the surrounding landscape using 10 land cover classes. 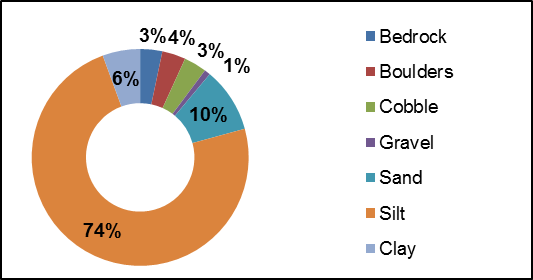 As shown in Table 9, the dominant land cover types in 2008 and 2014 were crop and pastureland along with woodland. From 2008 to 2014, there was an overall change of 195 hectares (from one land cover class to another). Most of the change is associated with crop and pastureland (i.e., previously cultivated areas/fallow fields) emerging as young woodland (i.e., regenerative and/or plantation) along with some smaller areas of woodland conversion to crop and pastureland (see Figure 50 for the location of the major changes). Table 10 shows the type of land cover change that has taken place between land cover classes/types from 2008 to 2014. Overall, the net area of crop and pastureland change (loss) is small at 96 hectares relative to the remaining area of crop and pastureland in the catchment (as of 2014). Similarly, the net area of woodland change (gain) is also small at 80 hectares relative to the remaining area of woodland in the catchment (as of 2014), as is the change (gain) in the area of settlement (at 19 hectares) when compared to the remaining settlement (in 2014). 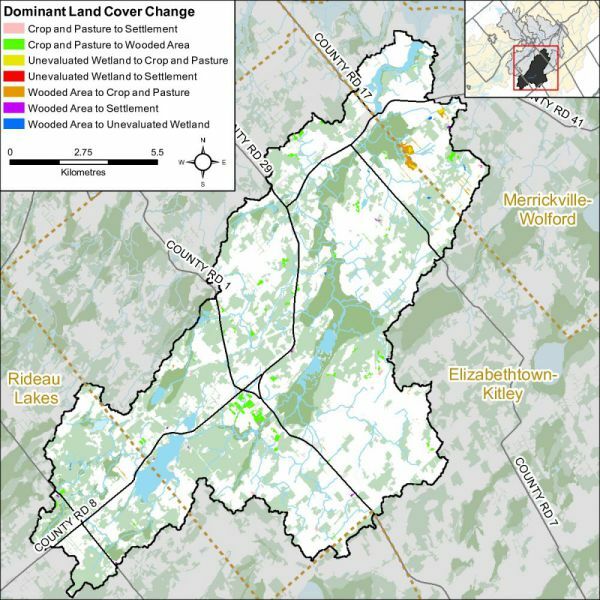 As shown in Figure 51, 38 percent of the Irish Creek catchment contains 5522 hectares of upland forest and 624 hectares of lowland forest (treed swamps) versus the 34 percent of woodland cover in the Middle Rideau subwatershed. This is greater than the 30 percent of forest cover that is identified as the minimum threshold required to sustain forest birds according to the Guideline and which may only support less than one half of potential species richness and marginally healthy aquatic systems. When forest cover drops below 30 percent, forest birds tend to disappear as breeders across the landscape. In the Irish Creek catchment (in 2014), 140 (35 percent) of the 393 woodland patches are very small, being less than one hectare in size. Another 199 (51 percent) of the woodland patches ranging from one to less than 20 hectares in size tend to be dominated by edge-tolerant bird species. The remaining 54 (14 percent of) woodland patches range between 20 and 550 hectares in size. Forty of these patches contain woodland between 20 and 100 hectares and may support a few area-sensitive species and some edge intolerant species, but will be dominated by edge tolerant species. Conversely, fourteen (four percent) of the 393 woodland patches in the drainage area exceed the 100 plus hectare size needed to support most forest dependent, area sensitive birds and are large enough to support approximately 60 percent of edge-intolerant species. Seven patches top 200 hectares, which according to the Environment Canada Guideline will support 80 percent of edge-intolerant forest bird species (including most area sensitive species) that prefer interior forest habitat conditions. Table 11 presents a comparison of woodland patch size in 2008 and 2014 along with any changes that have occurred over that time. An increase (of 80 ha) has been observed in the overall woodland patch area between the two reporting periods with most of the physical change in area occurring in the 50 to 100 and 100 to 200 hectare woodland patch size class ranges. In the Irish Creek catchment (in 2014), the 393 woodland patches contain 190 forest interior patches (Figure 51) that occupy seven percent (1213 ha.) of the catchment land area (which is greater than the five percent of interior forest in the Middle Rideau Subwatershed). This is below the ten percent figure referred to in the Environment Canada Guideline that is considered to be the minimum threshold for supporting edge intolerant bird species and other forest dwelling species in the landscape. 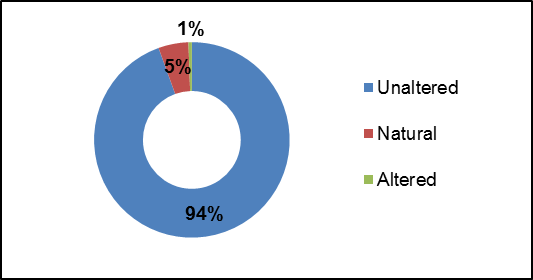 Most patches (163) have less than 10 hectares of interior forest, 111 of which have small areas of interior forest habitat less than one hectare in size. The remaining 27 patches contain interior forest ranging between 11 and 177 hectares in area. Between 2008 and 2014, there has been a notable change in the number of woodland patches containing smaller areas of interior habitat (Table 12) with an increase of 80 woodlands containing less than one hectare of interior forest over this period and 19 woodlands with one to 10 hectares of interior habitat. This has occurred as a result of the loss of interior forest habitat in the larger woodland patches in the catchment over this period. 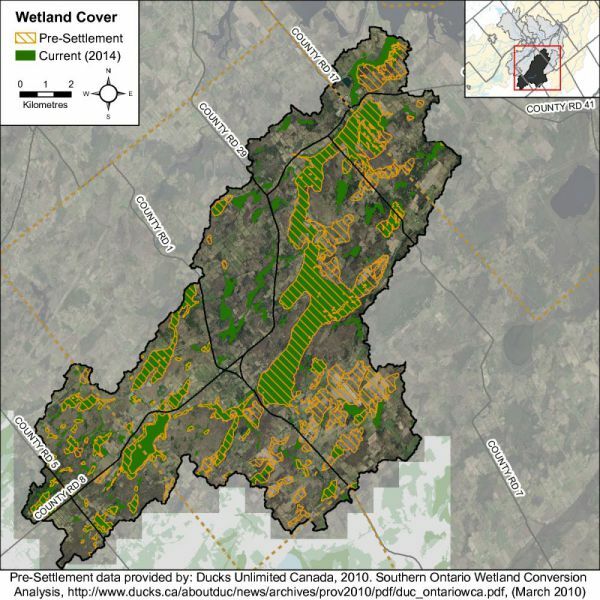 Using the same dataset, it is estimated that pre-settlement (historic) wetland cover averaged 32 percent in the Middle Rideau subwatershed versus the 27 percent of cover existing in 2014. This decline in wetland cover is also evident in the Irish Creek catchment (as seen in Figure 52) where there has been a two percent decrease in the area of wetland cover from pre-settlement times to the present (as summarized in Table 13). 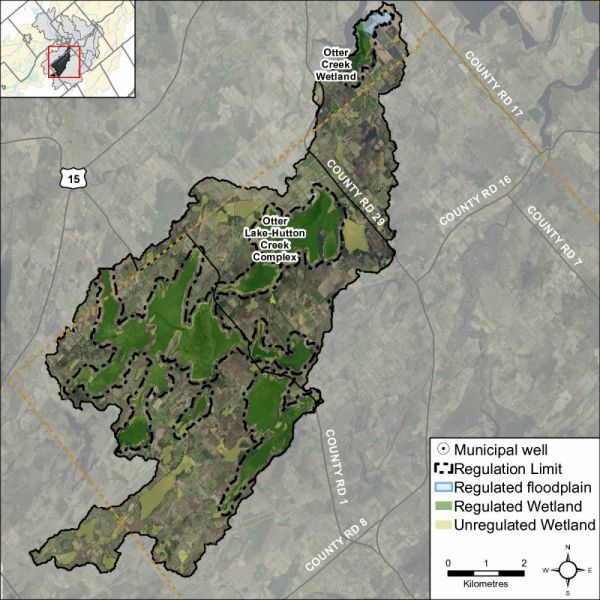 While there has been a reported decrease in wetland cover in the Irish Creek catchment from pre-settlement times, the remaining wetland cover in 2014 remains above the ecological thresholds cited in the Environment Canada Guideline. 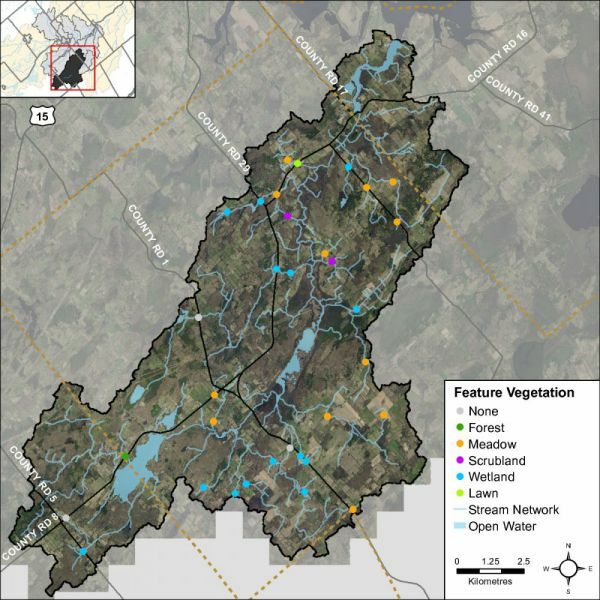 Nonetheless, in order to maintain critical hydrological, ecological functions along with related recreational and economic benefits provided by these wetland habitats in the catchment, a “no net loss” of currently existing wetlands should be employed to ensure the continued provision of tangible benefits accruing from them for landowners and surrounding communities. The RVCA and its partners are working to protect and enhance environmental conditions in the Middle Rideau Subwatershed. Figure 53 shows the location of all stewardship projects completed in the Irish Creek catchment along with sites identified for potential shoreline restoration. From 2009 to 2014, four septic system replacements, two well decommissionings, two well replacements and one education initiative were completed. Between 2003 and 2008, one septic system replacement, one well decommissioning, one clean water diversion and one fuel storage and handling facility were carried out along with one livestock fencing project prior to 2003. Total value of all 14 projects is $100,445 with $33,009 of that amount funded through grant dollars from the RVCA. 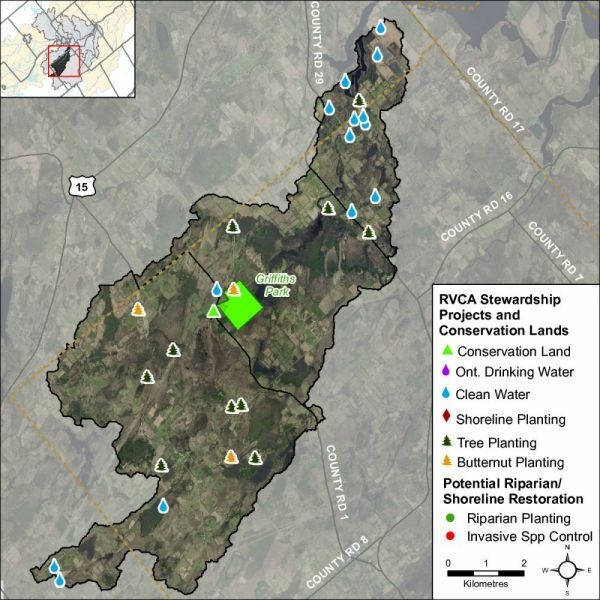 The location of RVCA Tree Planting Program projects is shown in Figure 53. From 2009 to 2014, 34,370 trees were planted at five sites. Between 2003 and 2008, 84,700 trees were planted at 16 sites and prior to 2003, 27,400 trees were planted at three sites, resulting in the reforestation of 75 hectares. Total value of all 24 projects is $515,140 with $171,776 of that amount coming from various fundraising sources. Through the RVCA Butternut Recovery Program, an additional 75 butternut trees were planted in the Irish Creek catchment between 2003 and 2014, as part of efforts to introduce healthy seedlings from tolerant butternuts into various locations across Eastern Ontario. With the assistance of the RVCA’s Shoreline Naturalization Program, 430 trees and shrubs were planted at one project location to create a 120 metre long shoreline buffer at a total project value of $1,068. The Irish Creek catchment covers 161 square kilometres with 38.3 square kilometres (or 24 percent) of the drainage area being within the regulation limit of Ontario Regulation 174/06 (Figure 54), giving protection to wetland areas and river or stream valleys that are affected by flooding and erosion hazards. Wetlands occupy 32.7 sq. km. (or 20 percent) of the catchment. Of these wetlands, 20.5 sq. 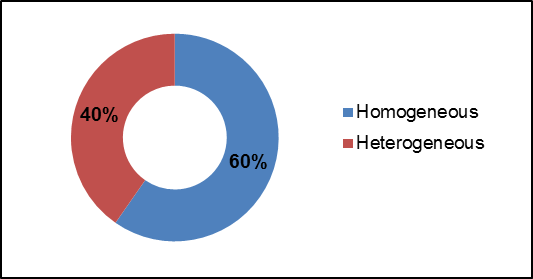 km (or 63 percent) are designated as provincially significant and included within the RVCA regulation limit. This leaves the remaining 12.1 sq. km (or 37 percent) of wetlands in the catchment outside the regulated area limit. Of the 232.6 kilometres of stream in the catchment, regulation limit mapping has been plotted along 103.4 kilometers of streams (representing 44 percent of all streams in the catchment). Some of these regulated watercourses (81.5 km or 35 percent of all streams) flow through regulated wetlands; the remaining 21.9 km (or 21 percent) of regulated streams are located outside of those wetlands. Plotting of the regulation limit on the remaining 129.2 km (or 56 percent) of streams requires identification of flood and erosion hazards and valley systems. The Irish Creek drainage catchment is considered to have a Highly Vulnerable Aquifer. This means that the nature of the overburden (thin soils, fractured bedrock) does not provide a high level of protection for the underlying groundwater making the aquifer more vulnerable to contaminants released on the surface. The Mississippi-Rideau Source Protection Plan includes policies that focus on the protection of groundwater region-wide due to the fact that most of the region, which encompasses the Mississippi and Rideau watersheds, is considered Highly Vulnerable Aquifer. For detailed maps and policies that have been developed to protect drinking water sources, please go to the Mississippi-Rideau Source Protection Region website at www.mrsourcewater.ca to view the Mississippi-Rideau Source Protection Plan.